Chef Charles' Kitchen: Gotta Put Love In Your Cookin'! Where there's smoke, there's not always fire. But enticing aromas escaping with wisps of smoke from a custom designed smoker can be smelled from blocks away. Sometimes people say they drive around until the smell gets stronger or they see the smoker. 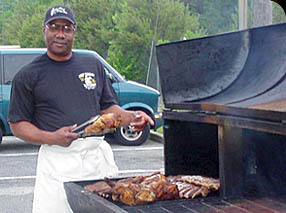 Chef Charles Gilbert stokes his smoker with smoldering oak logs, then arranges over 100 pounds of ribs and boneless pork and beef where it cooks slowly for hours. If all this talk about barbequing is making you hungry, stop by or call in your take out order today! Chef Charles also caters! Now matter what you've got going on, your guests will LOVE Chef Charles' cookin'! Click here to find out more. Located in the "Pep Boy's Shopping Center"